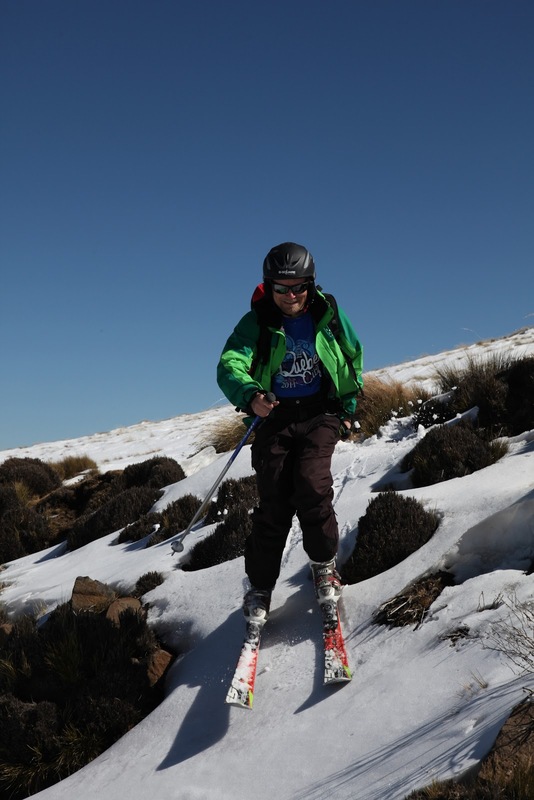 Skiing the Planet: Africa. Snow. AK-47s. 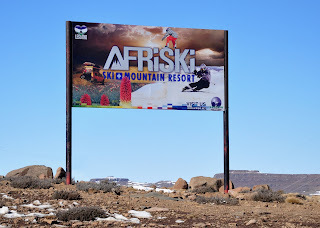 Entrance to the Afriski ski area in Lesotho, Africa. "Yes, of course. There's room in the back." I'm being more polite to strangers on the road than I would normally be, but its early hours in the mountains and we are tens of kilometers away from the nearest house in Lesotho, one of the poorest countries in Africa. And the two guys standing in the middle of the road are swinging their AK-47s. This is not a hitchhiking request. It is an order, backed up by assault rifles. Or a carjacking. Or a robbery. If we are lucky... The guys board our pickup. I try even harder than usual to avoid the biggest potholes, as they sit in the back with their guns dangling loosely in our direction. The road is not making a smooth ride easy, the conditions are the worst that we've seen on our trip so far. Actually, they are worse than I have seen anywhere. But as half an hour passes and we near the top of the Mahlasela Pass at 3225 meters, the gunmen are still content at sitting in the back. I stop the car, and tell the guys that this is the end of the ride and that I'm going to ski down the mountain. I grab my boots, and ask the guys to walk. If they plan on taking our stuff (or worse) this will be the moment. Surprisingly sheepishly, they get out of car and start walking. Phew. Or half of a phew, the danger is not fully over. We are a bit nearer the ski area now, which is comforting. But once I start skiing down Tero has to drive to the ski area, and he may still run into the same guys and now he would be alone. My route down the mountain gives me my first taste of African powder, and luckily, Tero never sees the guys again. Maybe they managed to walk far enough while we were preparing for the skiing, or maybe they found another victim. The gunmen were not the only problem on our way here. First off, getting to this side of Africa from Finland took sixteen hours in airplanes, and getting from the airport in Johannesburg to Lesotho took over seven hours. Almost as long as it took for us to rent the car. We had booked a four-wheel drive rental car on the previous week, but the deal fell through just a few hours before we departed for our mission. This was not the first time this had happened to me. There are several rental agencies that advertise low prices for vehicles without checking for availability and price from their contractors, and then withdraw at a last moment. We figured that we could get a car from the airport, but it turned out to be difficult. A national holiday had closed most of the rental car storage depots, and other travelers had exhausted the pool of available vehicles. A view towards the ski area from the Mahlasela off-piste. But the car was just a side issue on that day, I was on a bad mood for a far more serious problem: lack of skis. We flew here on British Airways, and despite being their highest level frequent flier and paying extra for a ski bag, our bag turned out to be the only one missing. They assure that it would be delivered to us the next day. On the next day they tell us that they have forgotten to load my skis on the next day's plane. On the day after that they claim that they cannot deliver a bag to another country as we had already driven to Lesotho. A threat about a full refund for our flight tickets finally ticked them that they might have to do something, and within minutes, a courier was summoned to make the 15-hour roundtrip to deliver the ski bag to us. 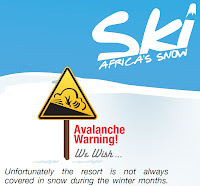 But our ski area, Afriski, came to the rescue. This tiny ski area has the best rental skis that I have seen anywhere. 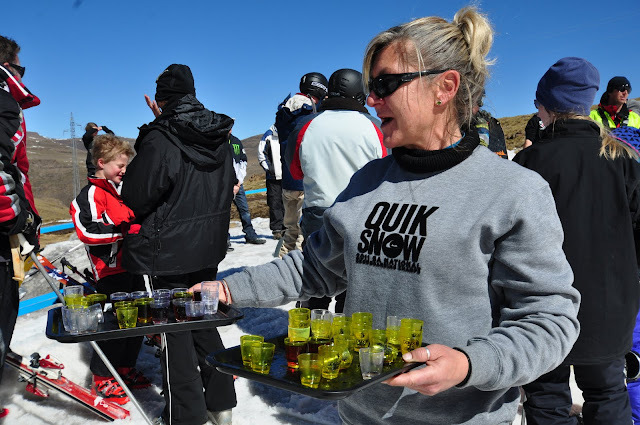 And it was probably a good thing that we had rental skis on Afriski's large open off-piste bowls, as they offered a mixture of snow, grass, and rocks. 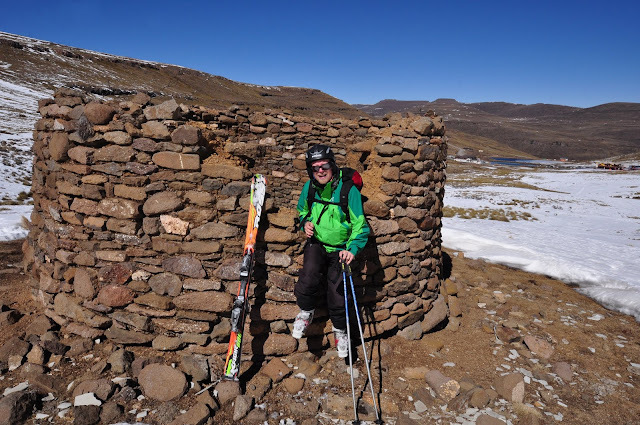 The courier brought our skis at the right moment, because once we left Afriski to tour off-piste skiing in South Africa, keeping the rental skis from Lesotho would have meant an extra day or two of riding in the car to return the skis. 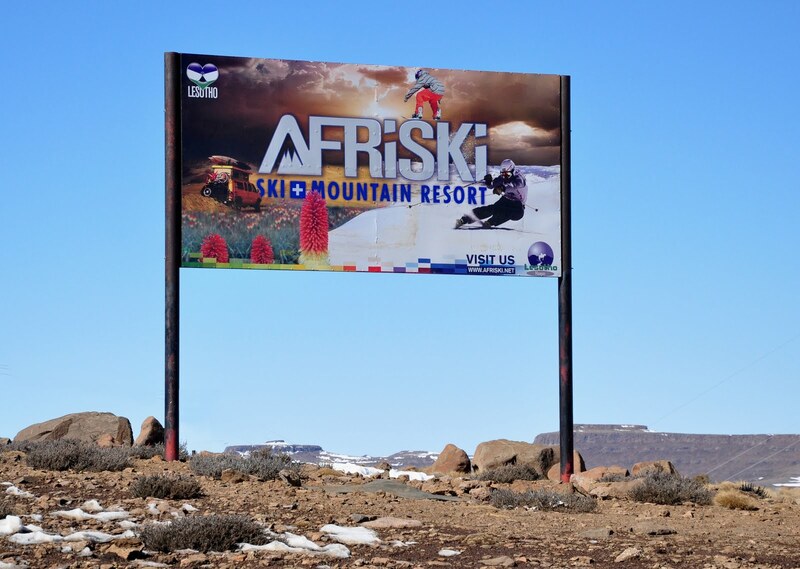 Afriski is currently the only ski area south of Morocco, as South Africa's Tiffendel went out of business earlier this year. Afriski is about 100 kilometers from the border of South Africa, in the highlands of Lesotho. The bottom of the ski area is at 3030 meters and the top is 300 meters higher. 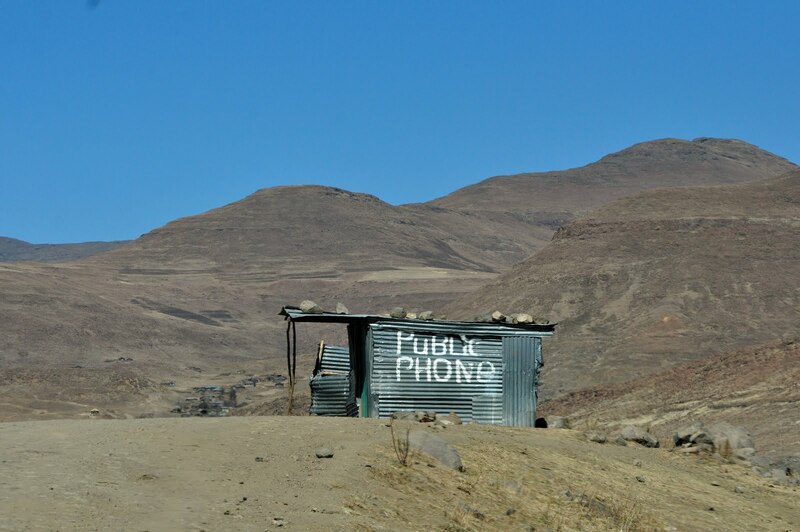 This really is highlands even for Lesotho, the highest country in the world. The lowest part of the country is at 1400 meters, and most of the country is located above 2000 meters. Lesotho was the perfect hideout for the tribes that fled here in the early 19th century. But it is also a cold, barren and dry land. 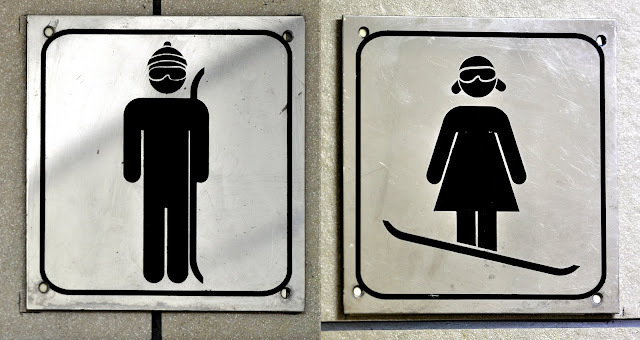 There is essentially one ski slope in the ski area, even if a twisting cat track and a tiny beginner's slope at the bottom have also been marked as official ski slopes. The main ski slope is straight, wide run down the fall line. 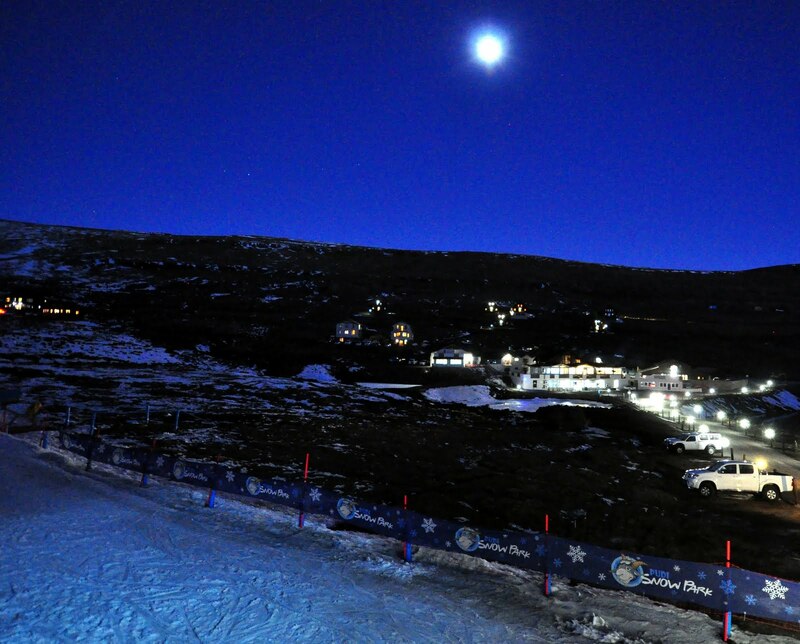 The form of the slope is not very interesting, but it is still a good ski run. It is steep enough to be fun to ski, and at over a kilometer, it is long enough to make your leg muscles feel the skiing. The snow is good, and there is plenty of it on the ski slope. And the views are incredible. Very different from anywhere else. Before this trip I had trouble picturing what skiing looks like in Africa, but the view to the reddish mountains says "Africa" very clearly. 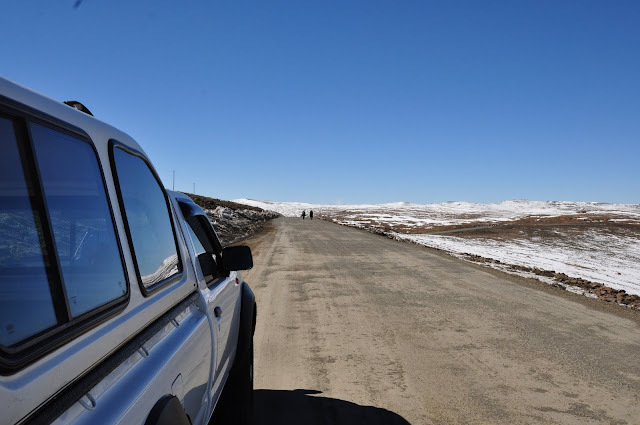 Our vehicle at the top of the Mahlasela Pass, 3225 meters. The main slope is served by one long T-bar lift. On the day that we arrived the lift was out of action. But not to worry, there are cats! The area's two cats could fit almost every skier on the slopes that day. And while we were waiting a couple of minutes for the next ride, they served shots of sherry. Class! The cats had two riding options, either on the top or hanging on to a rope. At first we rode on top, but then decided to try to rope. It felts easy at the beginning, but as the cat begun its seven minute climb through the steeper parts of the hill, it started to dawn on me that we would be basically hanging from the rope on our hands with most of our weight, for seven minutes. We held on, but did not try that again. One run, no matter how good will soon get boring. 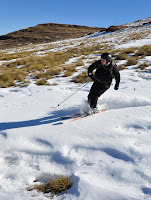 For me, the interesting part of Afriski was the off-piste skiing. It snows very rarely here, only a couple of times a year, but due to the cold and dry air, the snow stays on, sometimes even through the entire year. 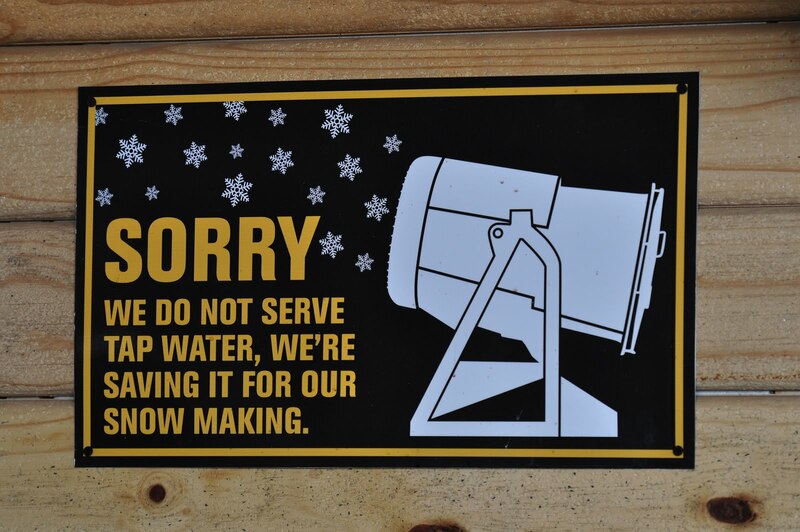 So even without artificial snow making there was snow. 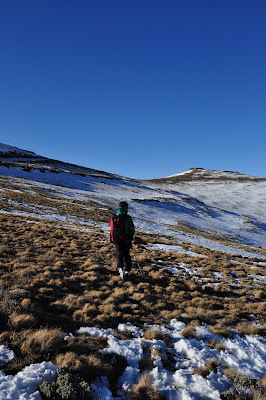 But the snow cover was thin and interrupted here and there by grass and rocks. Access to the off-piste runs is very easy. To the skier's right there is a cat track with some skiable terrain next to it. This is not a big area unless you are willing to commit to skiing down to another valley and climbing back up. 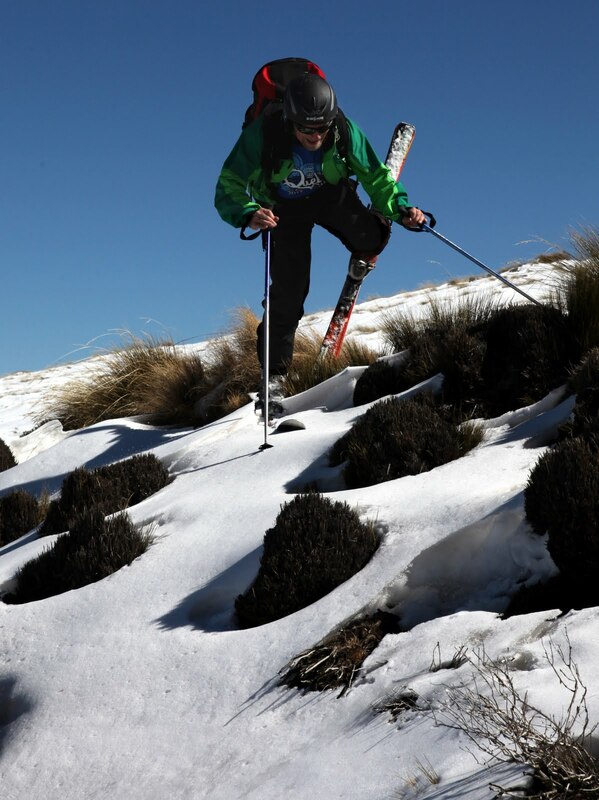 But even for staying within our own valley, it can give a taste of skiing through grassy snow. But watch out for the the occasional deserted corpses of automobiles. 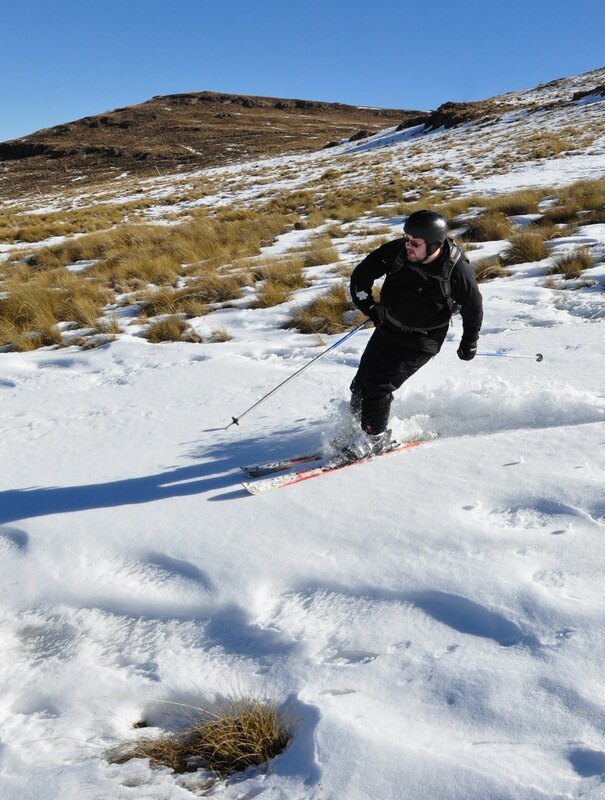 However, the most interesting off-piste runs are down from the Mahlasela Pass towards the base of the ski area. 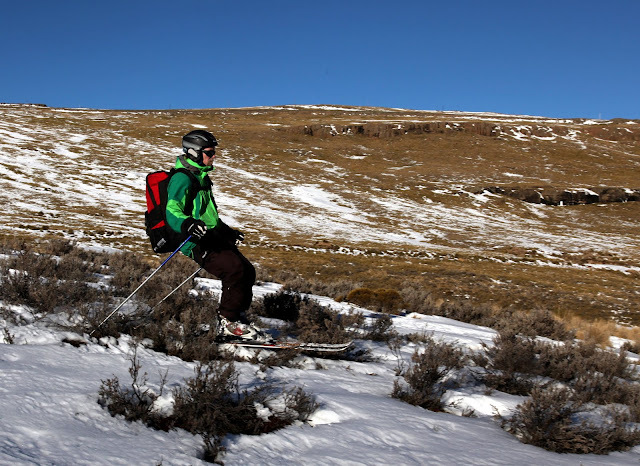 This area, the Mahlasela Ski Slope, can be accessed either by car from the road, or traversing to the skier's left from the top of the ski lift. Mahlasela is a wide open bowl, not very steep and with some hiking required at the very end. 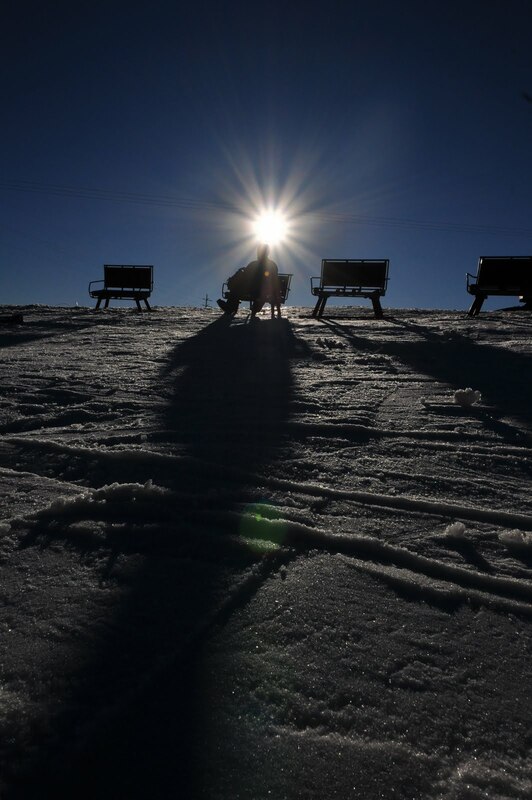 The first attraction of this slope is that it is the place where you can find some soft, untouched snow fields. On our trip we never saw anyone else venture outside the ski area boundaries; you'll have the whole mountain to yourself if you go here. Second, the mountain views and deserted rondavels (round stone huts) make for a unique experience. There are additional possibilities for off-piste skiing by taking your car further south on road that goes past the ski area. 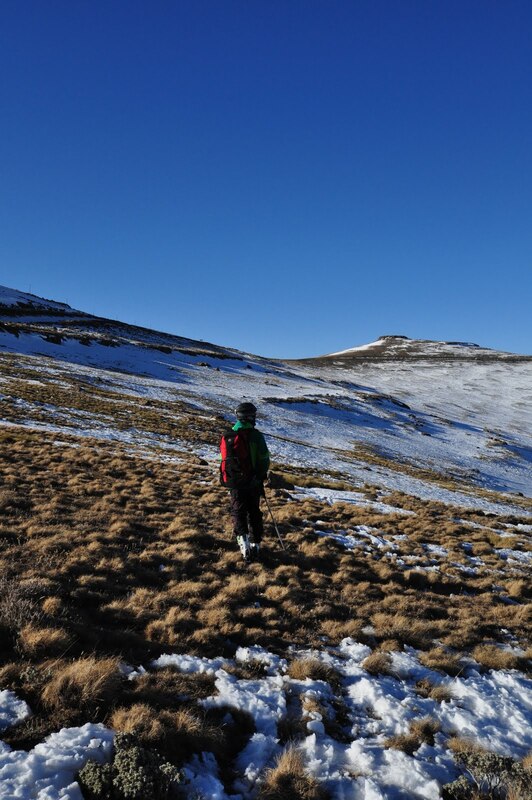 You can stop at almost any place in the next fifty kilometers and hike up. 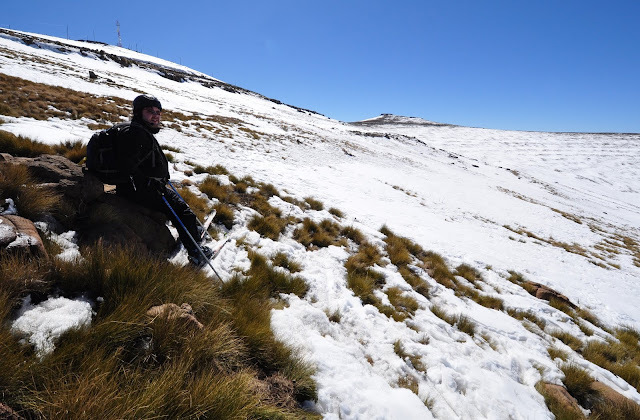 We did not have time to do this on our trip, but there is snow particularly on south facing slopes, and aside from occasional gunmen, the area appears safe. 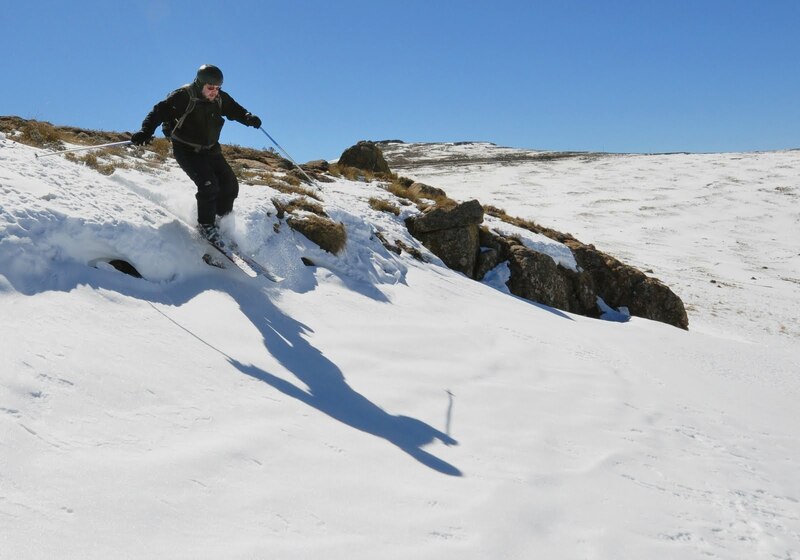 There are no steep slopes and snow cover is shallow, hence rockfalls and avalanches are not a problem. Visibility is usually good, given the dry weather. Afriski is 420 kilometers from the Johannesburg airport. However, while the roads in South Africa are generally good, there are several ongoing road work projects that will delay your trip. 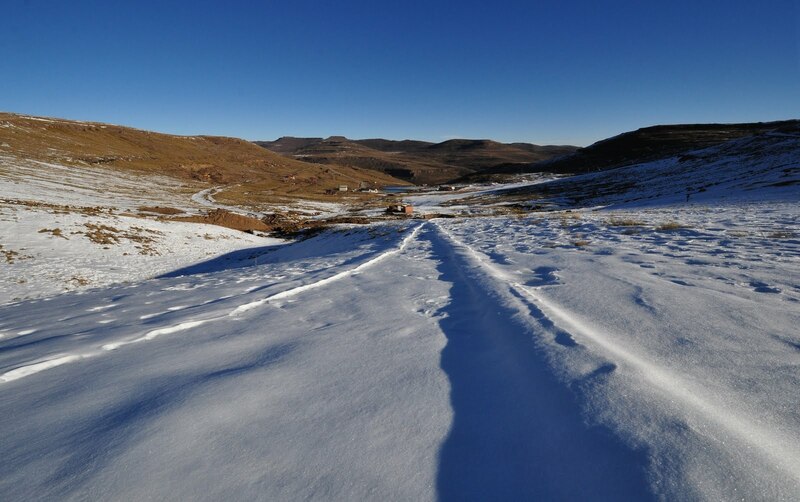 The border crossing to Lesotho will take time, and as you near Oxbow the road starts to get trickier. At 20 kilometers before Oxbow it will be like any twisting mountain road in the alps. After Oxbow it becomes a dirt road with incredible number of potholes, so expect to be doing just 10-20 kilometers per hour on this part. The bathrooms in Afriski have heating. And nice signs. 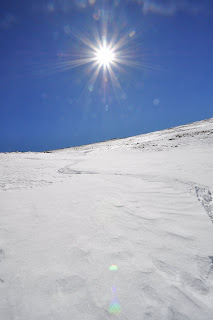 Winter season runs from June to August. 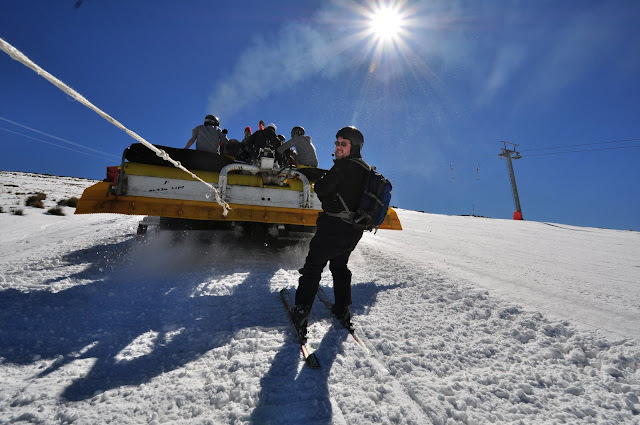 Lift tickets cost 350 Loti (or Rand, Lesotho and South Africa currencies have equal value) or about 35 €, but you are most likely going to get a discount voucher and pay only 30 €. But there is an additional 5€ to to pay at the entrance gate. Afriski does not serve soup, so it was impossible for me to measure the Goulash index. But a portion of pasta was served for 3€. 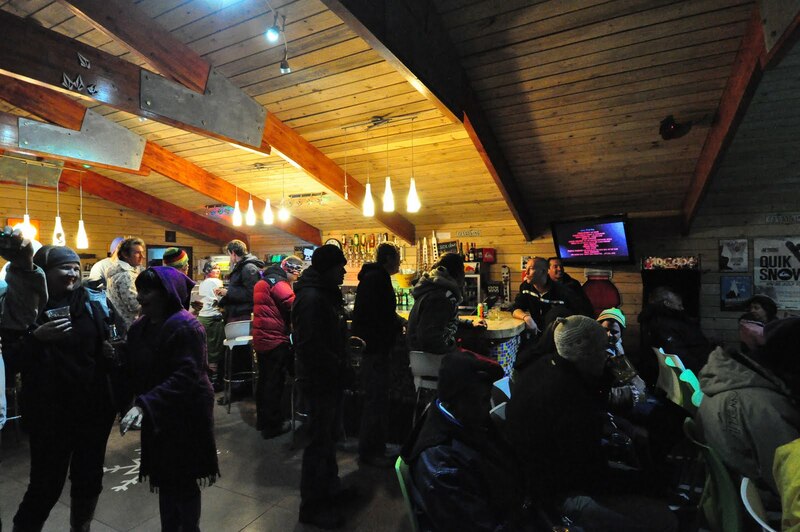 Not bad for the only restaurant in the ski slope, when the next competing restaurant is 80 kilometers away. I can recommend the pesto pasta, by the way, but if you are hungry consider ordering two. It is pretty small. There are just two places to stay in Afriski. Quite literally, as there are no other houses beyond these two. We stayed at the New Oxbow Lodge, half an hour down the road towards Butha Buthe. Their half-board service costs 70€ per night per person. 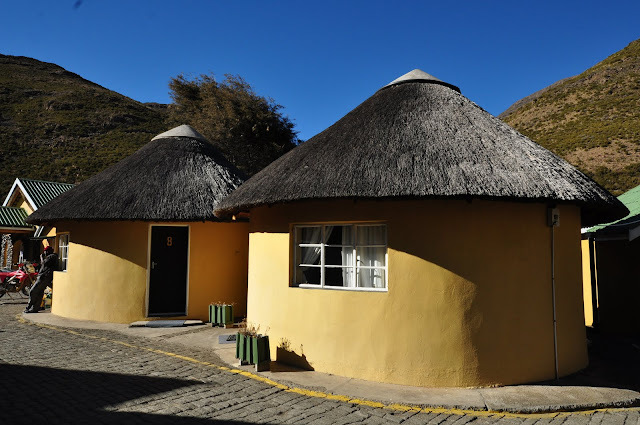 This is the local style accommodation, staying in round huts and eating local food. The personnel are very nice. However, electricity was only available for a couple of hours per day when the generator was running. And just like everywhere else in Africa, it was very cold in the rooms, even with huge gas furnaces heating at their full capacity. When I am writing this I'm already back home, and I have to say its good to be in Finland -- it was so damn cold in Africa! 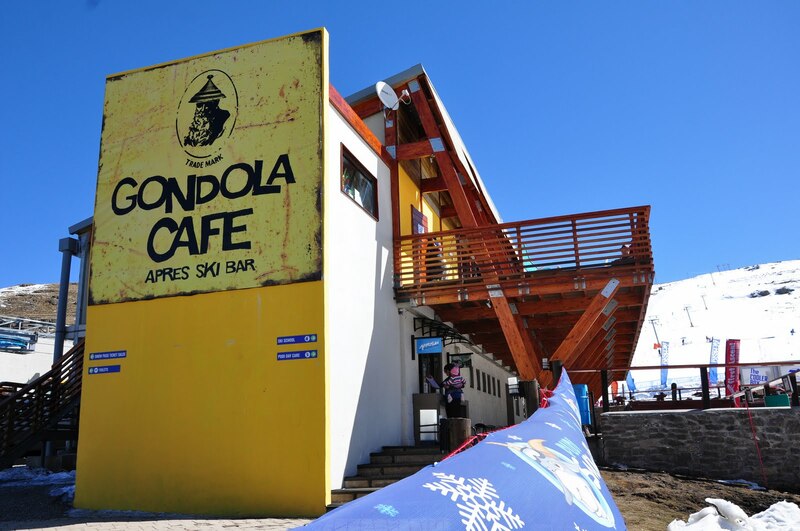 The more upscale accommodation option is to stay at the ski area itself. This costs a little bit more. And its more of western style and better equipped. Like with electricity, you should not expect much in terms of telecommunications in Lesotho. Cellphones worked only in the ski area and the hotel, not anywhere else. We found no local operators that would have roaming with Finnish operators. You can buy prepaid SIM cards at the hotels, but usually not in amounts that would make any length of an internal call possible. I don't need to say anything about the availability of Internet. I needed to participate in a work conference call while staying here, and managed find a SIM card that would allow me to ask them to call me. 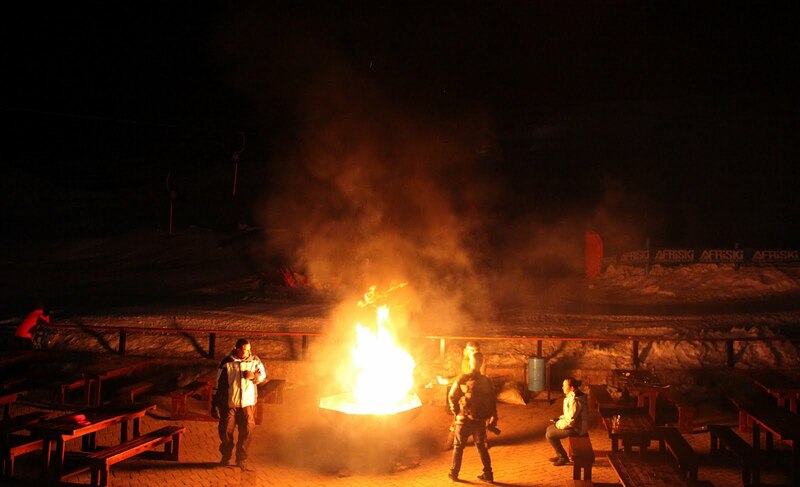 But it was a cold evening to stand outside the ski area bar (the only quiet place) to have a conference call. 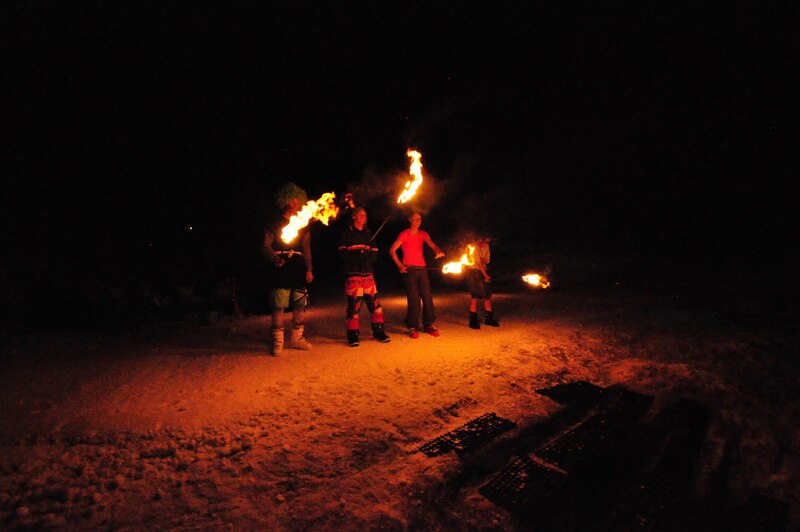 The skis are burning. Gods are pleased. 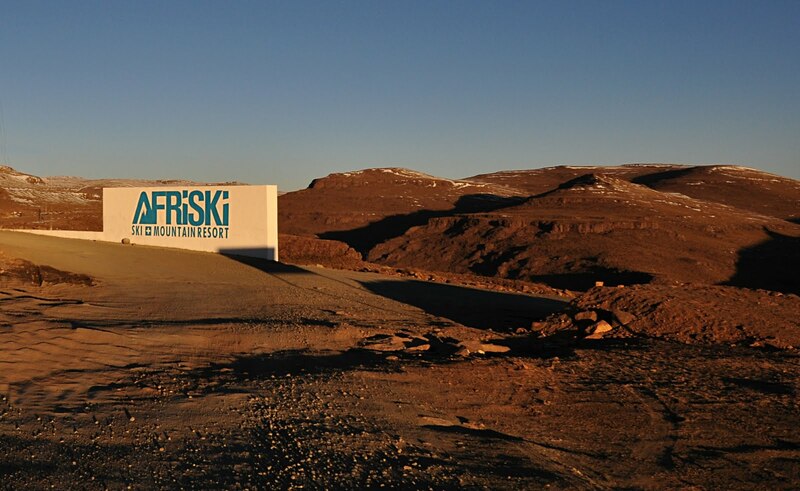 Afriski felt almost like a mirage, an unreal oasis in the desert. There was electricity, technology, everyone spoke perfect English, the shop was stocked with best possible skis and clothing, the restaurant served western food, bathrooms had heating, there was plenty of snow and evening activities, the personnel was very friendly, and there was sherry in the cat waiting line. Everything you could wish for. All this for a few dozen tourists. 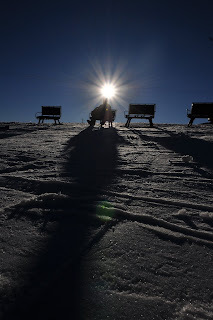 The ski slope is not big, but its hard for me to name any other ski area that is as nice and friendly. 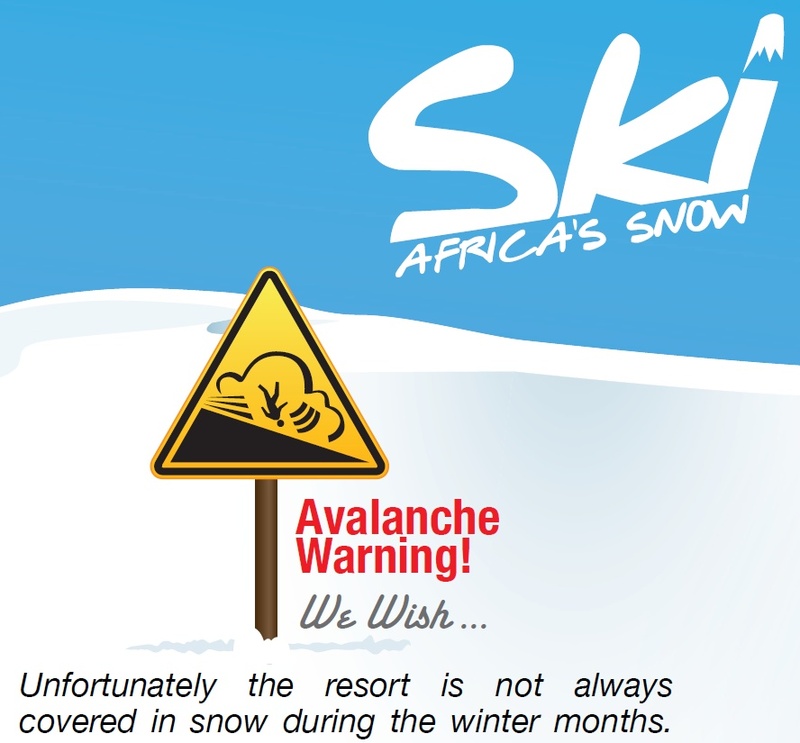 Maybe this is the African treasure that has not yet been found by many skiers. And then when you exit the ski area you are suddenly in one of the poorest countries in the world, threatened by AK-47s. Talk about contrast. There is a ski burning event in the evening, where the instructors burn skis in order to please the snow gods. I'm wondering if this event has something to do with having the newest skis in the rental place? 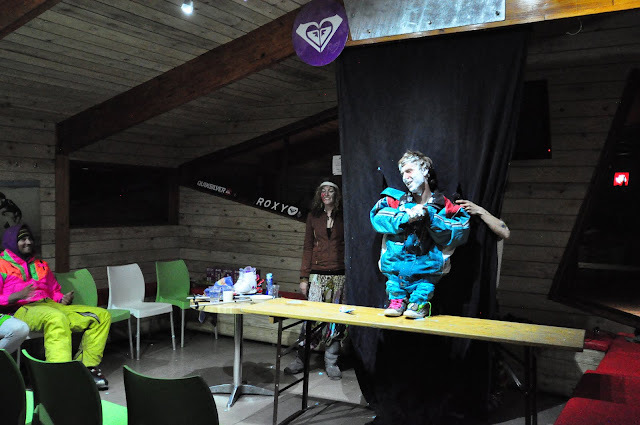 There are comedy shows, performed by the ski instructors. Awards from the day's ski competitions are given out. Comedy shows in the afterski bar.